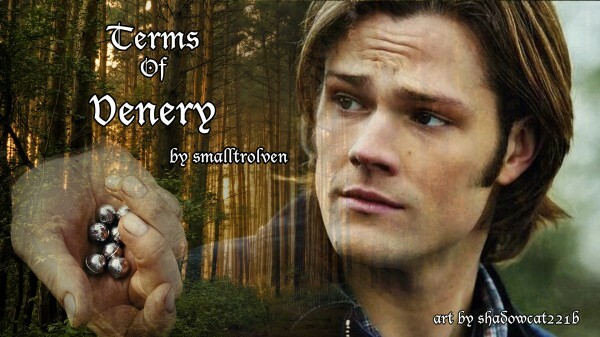 Summary: In an effort to woo his newfound love, Dean, (who happens to be the son of his boss, John the Forester), young hunter Sam asks for help from another hunter Brady, whose soul is to be forfeited to the devil on the following day, and hopes to obtain three more years of grace by substituting Sam in his place. A magical casting of enchanted bullets takes place in a terrifying Glen. Author’s Notes: Not my characters, only my words. Originally written for spnopera but not finished in time for the challenge. Story is based on the opera, “Der Freischutz” by Carl Maria Von Weber. Repurposed for the spnaubigbang because I just couldn't get the story out of my mind. Thanks so much for the wonderful art to shadowcat221b. Title from the word-of-the-day email that arrived the day I was searching for a title, could it possibly be more fitting? 1. The practice or pursuit of sexual pleasure. In olden times one was supposed to know the terms of venery. !~*@~*! Part One !~*@~*! Part Two !~*@~*! Part Three !~*@~*! Part Four !~*@~*!